Ash is surprised when he awakens in an asylum. The phrase 'bottle episode' refers to an episode of a TV show that confines its central cast members to a single location, usually to save a little of the show's budget. 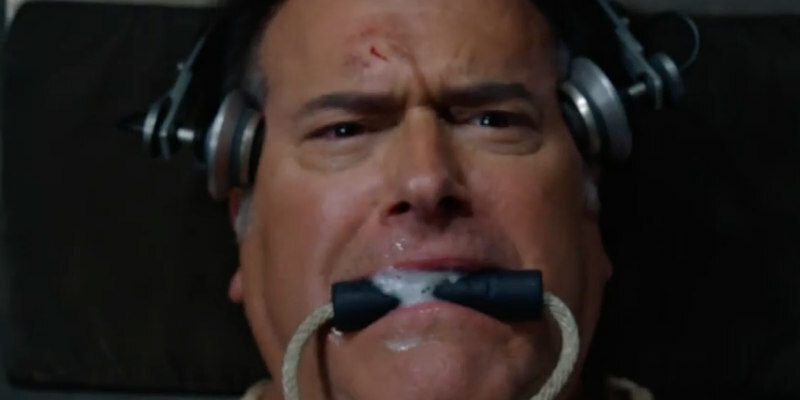 This week's edition of Ash Vs Evil Dead, Delusion, falls into the bottle category, but bucks the trend by featuring an entirely new locale that likely cost just as much to put together as any other episode. Said locale is an asylum, where Ash (Bruce Campbell) is startled to awaken and be told by his doctor, who looks suspiciously like the demon Baal (Joel Tobeck) in a white coat, that he's been resident there since the '80s, having been arrested for the murders of his four friends who perished in the infamous cabin in the woods of the original film. Turns out Baal is messing with Ash's head, conning him into this delusion in an attempt to have Ash lead him to the Necronomicon. 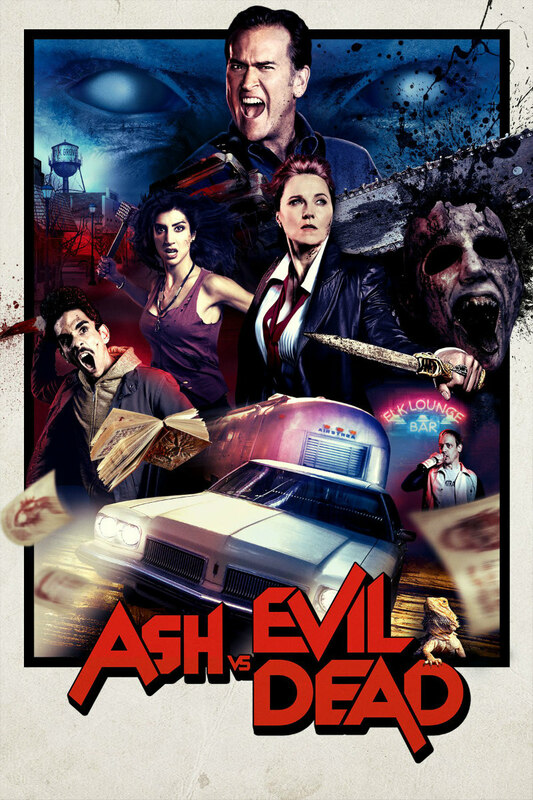 As Ash investigates his new surroundings he discovers Kelly (Dana DeLorenzo) is also an inmate, with a particularly disturbing way of counting with her fingers, while Ruby (Lucy Lawless) is a nurse (appealing to one of Ash's more sordid fantasies) and Pablo (Ray Santiago) is a warden. His old love Linda (Michelle Hurd) has been devotedly visiting him for the past 30 years. Ash is presented with a puppet lookalike named Ashy Slashy, which should have been exploited to greater comic effect. I can't think of too many actors who could mine the potential of this scenario for one-man comedy better than Campbell, but it's a prop that's largely wasted here. Arguably the highlight of this episode was Joseph LoDuca's score. I haven't mentioned LoDuca's work on the show much because it's generally not something I notice, which I guess is the mark of a good score, but the intimacy of this episode made it stand out. Delusion's score was a thrilling cross between the soundscapes of Psycho and It Follows. Opinion is divided on bottle episodes, but I have to confess I'm a fan, as they usually allow us to get to know a show's characters free from the distractions of the ongoing narrative. In the case of Delusion however it simply felt like an interruption, as it didn't reveal anything new about the show's characters. Though Elk Grove has proved a fertile location in recent episodes, I'm beginning to miss the road trip aspect of the first season, and I'll be happy when Ash and friends hop into the Oldsmobile and hit the highways again.